Why does my husband think that "in the den, next to the computer desk" is the appropriate place to store his kite collection? How old do human offspring have to be before they can forage for food on their own? For you homeschooling moms out there: Is 2nd grade really necessary? It seems to have slipped through the cracks around here. Who invented the asterisk? And why? Is it righ t to be jealous of the commenter who came up with the joke I wish I had made yesterday? Hats off to Murr Brewster, who opined that "A machine-gun carrying chicken in Starbucks would be all right." Be upset about health care reform, if you will - but be upset over facts, not fiction. Myself? I am upset that adults with pre-existing conditions are not fully covered for 4 more years. Put those diseases on hold, folks! We'll get to you eventually. Do Weight Watcher's points count if you are stuck inside with the kids on a rainy day? Should health care reform have addressed this issue? Discuss. 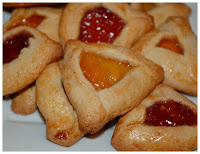 Why the picture of hamentashen? WHY?? I haven't managed to investigate the gluten-free possibilities on that one. We make hamentashen every year. Well, we USED to, anyway. No, 2nd grade isn't necessary. As far as I can tell, my kid hasn't done much this year that we didn't already do, although he does have a lot more questions about divorce than he did before we sent him to school. Second grade is just part of the progression, and it's one of those years where you can do a lot or a little and pretty much have the same results. She does remember junior high and high school and me flinging the Algebra book across the room. :) And the endless hours of discussing politics, crying over essays to be written, and lectures about the time wasted fretting over teenage boys. Kindergarten, first, and second grade are all, in this household, considered irrelevant and unnecessary. Third grade is negotiable. Second grade is not necessary imo. It is very annoying when people start screaming that we are becoming Cuba or something. It is their fear and ideology that makes them think that way. On the other hand, we are expanding gov't power and interference in our personal and moral lives. So it isn't like we are moving away from socialism. I'm waiting to see if this comment shows up. The last two comments I made on previous posts didn't. Are you censoring me? Don't you like me anymore???? No! I never censor, unless the comment is rude and/or inflammatory. Or spam. I don't know what happened to your comments. I'll look around. They're probably in this mess here somewhere. At least your husband doesn't store his sneakers, socks and snacks under the coffee table. Ugh. Ooh, you have BURNING questions. Yes, the "government takeover" is a terrible misnomer. If anything, they've taken and handed a lotta business to the private sector by mandating purchase of coverage. No Kidding! Second grade - sheesh, what is that all about? Seems like it was just a huge waste of time. My kids did 1st grade review, heard what they will do in 3rd grade, and played a lot. All it did was make my kids bored to death and develop a poor attitude about attending school. Can't they do that in 8th grade? Thank you SO much for writing this! I'm feeling a need for someone calm and correct to refer people to right now. I loved second grade. We lived next door to the school and I used to sneak home through a whole in the fence for lunch. The screaming of socialism is just the worst. Not only is it factually incorrect, it's purposefully divisive. I just think people want to be mad about Democrats (and Obama) for something, so they've chosen healthcare. It's so weird. So, so weird. I have fond memories of second grade. Do you homeschool? I do think weight watchers points still count on rainy days, unfortunately. But it is easier to forgive yourself for cheating. 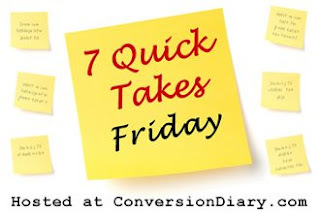 Great quick takes! I agree wholeheartedly with the government on health insurance thing, and I would certainly reassure you that Weight Watcher points do NOT count when you are home with the kids because you are burning off lots of extra calories running after them and cleaning up. It should even out! My 2nd grade teacher was a crabby old woman that smelled of urine. That's about the only thing I can remember about 2nd grade, so to answer your question, no it's not necessary in the least. Teach him/her the times tables. Then you're good on 2nd grade. I'm baffled as to how you think throwing a rock through someone's window is going to effect a change in anything. Clarification to the previous comment. I meant to say, "I'm baffled as to how 'one' could think . . ."
I didn't mean to imply Suburban Correspondent either participates in or advocates throwing rocks or bricks! I was referred over to your blog by Bonnie, she is my cousin. I just wanted to say THANK YOU THANK YOU THANK YOU!! for your post about health care. Finally a voice of reason. Great read, you are an awesome writer. I'm guessing second grade isn't important. They let me skip it. Plus I started school a little young. My parents were old and not planning to have kids in the house at their age. By the time I went to college, I was almost five feet tall and thinking about having my first period and wondering where babies came from. Homeschooling in general is fine but not if you're hot for teacher. As for "government takeover"--could we HOPE? Don't get ME started. You rock. My husband thinks anything without a home known to him belongs "in Mom's craft area." Because, after all, why have a craft area if you can't store junk in it? Right. My opinion about second grade is more along the lines of just getting and keeping them reading! That momentous step when they actually pick up a book on their own and read it for fun! I remember dropping everything when they wanted to be read to aloud (but don't ask me to play any games or anything). Having older kids now, I find their "memories" of homeschooling and life "back then" are quite different than my own. And I'm sticking with my version! Don't get me wrong, they all say they are so glad they homeschooled and hope to be able to do it for their own kids...it's just that they have these CRAZY, INACCURATE memories of things that drive me nuts! I'm with one of the other commenters, all that work trying to be creative with helping them learn is long forgotten. UGH-I so hear you on repeating statements without actually, you know, making sure they're true. I understand if somebody has issues with the reform bill. I have a few myself. But please, know what you're talking about before you try to get into a debate. When one side throws rhetoric and hyperbole around as an argument, nobody wins. Except maybe the talk show hosts.